Randall Bassett delivers his closing argument on behalf of R.J. reynolds, accused of responsibility for the laryngeal cancer and eventual death of Ralph Shadd. West Palm Beach, FL—Jurors this week found a Florida smoker's cancer and death were caused by R.J. Reynolds cigarettes, but shut out the smoker’s widow on her claim for damages against the tobacco company. Shadd v. R.J. Reynolds, 2008-CA-038631. The 15th Circuit Court jury in Palm Beach County awarded nothing to Doris Shadd, despite finding her husband Ralph suffered from nicotine addiction that fueled his half-century smoking habit and ultimately led to his death in 2007. The decision initially prompted Shadd’s legal team to claim the verdict was fatally inconsistent. However, after a recess, Shadd’s attorneys dropped their objection to the verdict, contending any problems with the decision were properly addressed on a post-verdict motion for additur. Ralph Shadd, a WWII Army Air Corps veteran smoked more than a pack of cigarettes a day for over 50 years, ultimately quitting in 1996 after he was diagnosed with laryngeal cancer. He was later diagnosed with lung cancer and died in 2007 at 81. Doris Shadd claims Reynolds’ participation in a decades-long scheme to hide the dangers of smoking ultimately led to her husband’s nicotine addiction, cancer, and death. Monday’s verdict followed a 13-day trial centering on responsibility for Shadd’s cancer. During last Friday’s closing arguments, Searcy Denney’s Laurie Briggs highlighted Reynolds’ participation in a multi-pronged scheme to hide the dangers of smoking, including marketing light and low-tar cigarettes as safe smoking alternatives and publicly denying the addictive nature of nicotine. “They knew it, they lied about it, and that was their business plan,” Briggs said. But the defense contended Shadd was to blame for damage his smoking may have caused. During last week’s closings, King & Spalding’s Randall Bassett argued Shadd never made a concerted effort to quit before he turned 50, which Bassett contended could have reduced Shadd’s smoking-related cancer risk by 90%. “Mr. Shadd was responsible for his own lung cancer and death based on his own decisions about smoking and quitting,” Bassett said. 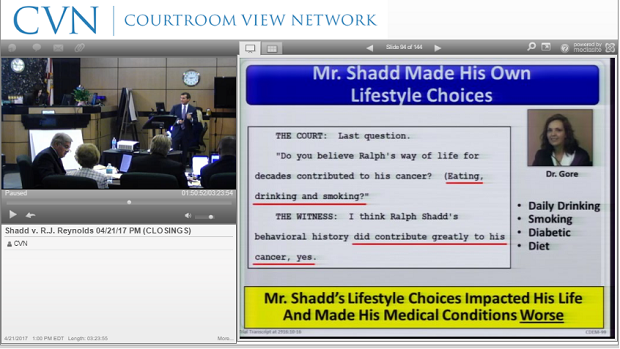 Beyond their rejection of any damage award, jurors found Reynolds only 5% responsible for Shadd’s cancer, apportioning the remainder to Shadd himself. Searcy Denney’s John Scarola, representing Doris Shadd, had requested at least $1 million in compensatory damages, plus potential punitives, in last week’s closings. This isn’t the first time Reynolds has escaped liability for damages, despite a finding of responsibility for a smoker’s cancer. In 2014, Broward County jurors found George Banks was an Engle class member and apportioned 15% of responsibility for Banks’ esophageal cancer to the tobacco company, but rejected any damage award to his family. Last year, the state’s 4th District Court of Appeal affirmed the trial court’s decision in a per curiam opinion. Doris Shadd is represented by Searcy Denney Scarola Barhnhart & Shipley’s John Scarola, Laurie Briggs, and T. Hardee Bass. R.J. Reynolds is represented by King & Spalding’s Randall Bassett, Philip Green, and Harold Franklin. Learn about CVN's unrivaled tobacco litigation library.